Samoan captain Semo Sititi has warned both England and South Africa to expect an upset in Pool C of the Rugby World Cup. The Pacific Islanders are not fancied to make it to the quarter-finals, with the team riddled with financial problems and a lack of match practice. But Sititi, who plays his club rugby with Scottish side Borders, said the Samoan heart would be enough to see his players through. He told this website: "I'm not going to promise we will easily qualify for the quarter-finals but there is going to be an upset and we want to live up to that. "We can win the game with the belief we have. We know it's going to be hard but it's all up to us." Sititi believes South Africa look the likelier recipients of a Samoan upset. The two sides meet in their final pool game on 1 November. But the 29-year-old already believes his team-mates have a weapon to upset the Springboks. He said: "The Samoan heart is what we will rely most heavily on. It's how we play and it helps our preparations. "Everyone looks after each other and loves each other. We take care of each other both on and off the field. "On top of that, it's our national sport and everyone loves that sport. 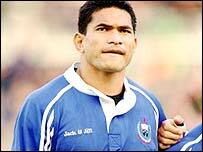 They love the team, support us every year and always give 110% for the Samoan team." Sititi hails the support from the islanders as "enough to keep us going in even the toughest games". The skipper also looks back 12 years for further inspiration and the day the Samoans beat Wales in their opening pool game of the World Cup. Sititi added: "I remember in 1991 when I was just 15 or 16, we didn't have any TVs at the time. "But they set up four big screens at Apia Park. The whole island watched it from there. Although the game was on at three in the morning the people still attempted to support their team. "I remember that sort of support every time I play for my country." Pride and passion are sufficiently strong for the Samoans going into their four pool games. But off the field, financial problems have meant the team cannot even afford any warm-up games in the three months leading up to World Cup kick-off. "I'm a bit worried as we haven't played any games at the moment," Sititi said. "England and South Africa have been playing a whole host of games but we can't do anything about it because we don't have any money. We'll just have to make do."